The Atlanta Braves sent outfielder Josh Anderson to the Detroit Tigers for reliever Rudy Darrow. This is pretty clear evidence that top prospect Jordan Schafer has won Atlanta's center field job. 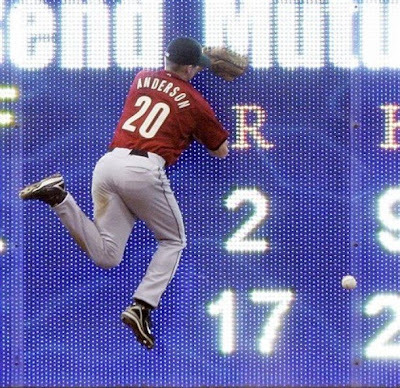 Anderson was in competition for the center-field job with the Braves, but immediately hit the trading block when he apparently lost out to Jordan Schafer. He'll be an extra outfielder in Detroit, where the starting trio of Curtis Granderson, Carlos Guillen and Magglio Ordonez is set. The 26-year-old Anderson played 40 games with the Braves last year, batting .294 with seven doubles, three home runs, 12 RBIs and 10 stolen bases. His Minor League numbers give a better glimpse of his speed, he swiped 42 bases in 49 attempts over 121 games at Triple-A Richmond last year and boasts 280 stolen bases in his six-year Minor League career. Jordan Schafer should add speed and power to the Braves lineup. I see him becoming an eventual 20/20 type on an annual basis. I hardily recommend him in all NL-only leagues and he should contribute in deeper mixed leagues as well. I'm not totally sold on Schaefer. I'm just a little skeptical because he hasn't put together great numbers in the minors, but obviously the numbers don't translate. Still I think the best course of action could be to wait. People took Justin Upton too soon last season and shouldn't make the same mistake again. I can understand not being sold on Schafer or any rookie for that matter. But speed prospects are usually useful a lot sooner than the raw power guys. Even Upton really just needs to stay on the field for the entire season to eclipse 30 homers.